University of the Punjab, Lahore: B.Sc., 1985; M.Sc., 1987; University of Agriculture, Faisalabad: Ph.D., 2004; University of Winnipeg, Manitoba, Canada: Post-doc., 2007. Chairman, Department of Chemistry, University of Agriculture, Faisalabad, 2014 to date;Member BOG, National Centre of Excellence in Analytical Chemistry, University of Sindh, Jamshoro, Sindh; Advisor, International Foundation for Science (IFS), Sweden. Gold Medal in M.Sc., University of the Punjab, 1987; Muhammad Ali Gold Medal in M.Sc., University of the Punjab, 1987; Badar-ud-Din Gold Medal in M.Sc., University of the Punjab, 1987; Productive Scientist of Pakistan, 2006, 2007, 2008 by Pakistan Council for Science and Technology; Star Laureate 2008 in Science & Technology by South Asia Publications; President’s Medal for Science &Technology, 2009; HEC University Best Teacher Award, 2010; PAS Gold Medal in Chemistry, 2011; Research Productivity Award by PCST, 2010-2011, 2012-2013, 2013-2014, 2014-2015; Two Top cited papers award for 2012 by UAF of each cash prize Rs. 50,000/; Top cited paper award for 2013 by UAF of cash prize Rs. 50,000/. 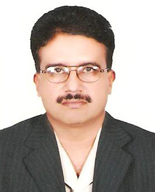 Member, Association for the Advancement of Science in Pakistan, Lahore; Life Member, Chemical Society of Pakistan; Member, American Chemical Society; Member, Biochemical Society; Fellow, The Chemical Society of Pakistan; Member, Editorial Board, Pakistan Journal of Agricultural Sciences; Editor, International Journal of Chemical and Biochemical Sciences. Production, purification, characterization, and engineering of enzymes; Bioremediation and biosorption of textile dyes and effluents and heavy metals; Bioleaching of low grade ores by indigenous microbes.